Followed up by an extensive written quotation or estimate, along with alternative prices for using suitable stock materials if savings can be made. All of our technical staff and Estimators are time served, fully qualified fitters themselves and have had many years previous experience of installing contract floor coverings. You will be dealing with friendly knowledgeable staff - Not just a sales person with a calculator and an order form in his hand who has probably never handled or installed a floor before! Part of our service is to give free technical advice and material recommendations for specific areas of use and to advise on suitable sub-floor preparations if required. 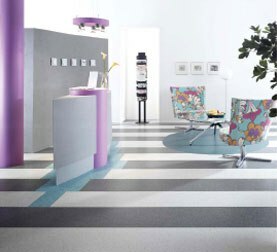 We can offer cost effective flooring solutions for all purposes, utilising our many years of experience combined with our vast selection of discounted stock materials. Such as Epoxy surface membranes which allow the floor coverings to be installed over damp sub-floors in old buildings or new fast-track projects.